Last month my family and I travelled to the island of St. Maarten (a.k.a. St. Martin). This was our second time visiting this Caribbean destination, and we dined at several restaurants during both visits. Out of all the places we ate at, two stood out because of their excellent customer service and delicious food. 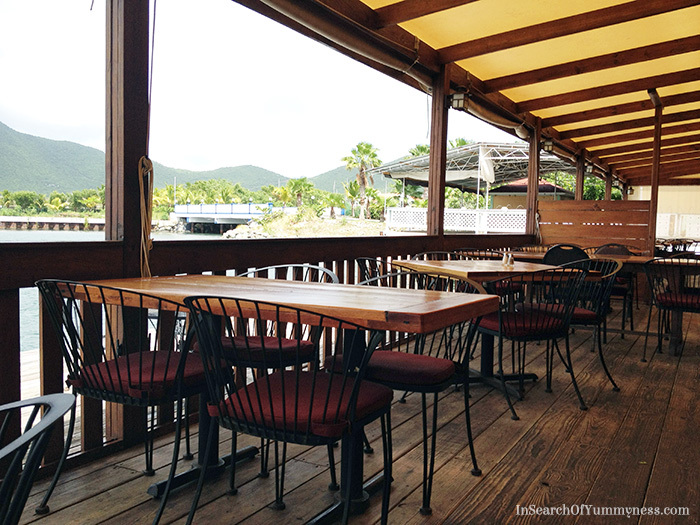 SkipJack’s is my number one pick for casual dining in St. Maarten, and it has been voted Best Seafood Restaurant by one of the local newspapers. I love the dining room with the open back wall. This makes the restaurant sunny and welcoming by day, and calm and relaxed at night. It’s so nice to enjoy your meal while sitting by the water, especially if there’s a warm breeze in the air. 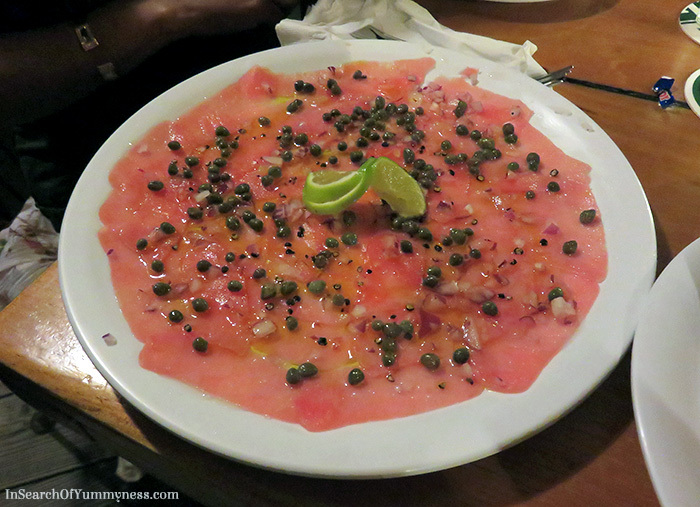 My favourite dish at SkipJack’s is the Tuna Carpaccio. I love this dish so much! The thinly sliced tuna almost melts in your mouth, and I love the kick from the red onion and capers. This is the kind of food that I enjoy the most: simple, fresh and delicious! They also have a really tasty lobster bisque on their menu. 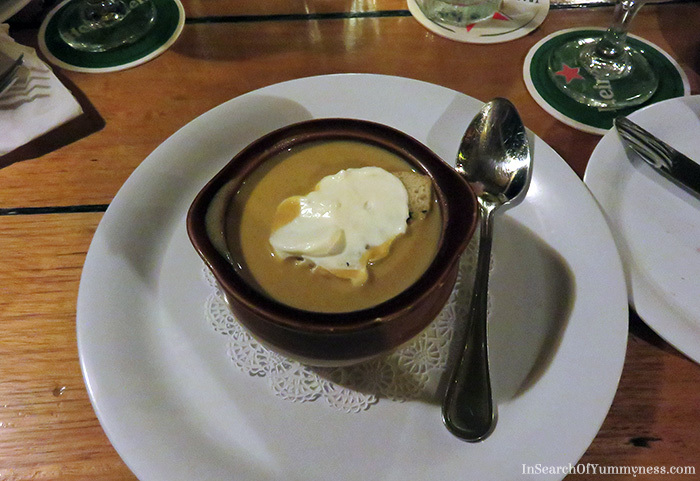 The broth has a rich lobster flavour without any fishiness, and the sour cream (or maybe it’s crème fraîche?) adds creaminess. 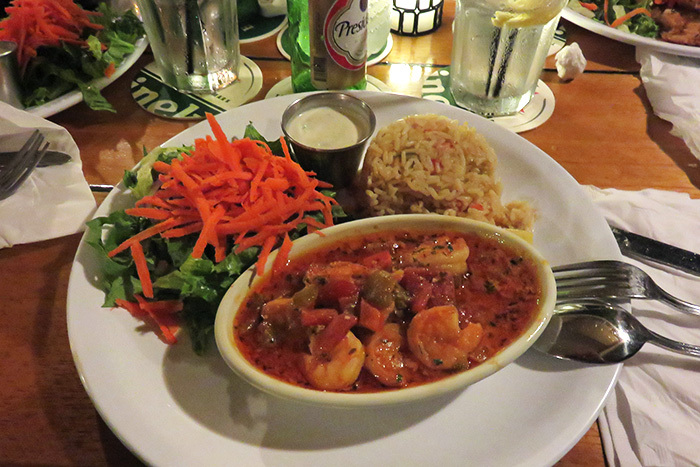 The shrimp creole dish is also a good choice is you want a small dinner. The creole tomato sauce is very flavourful, and it’s really tasty with the rice. 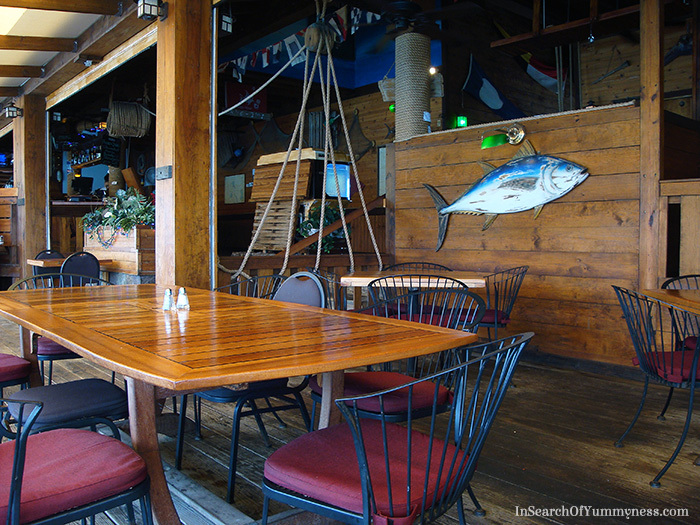 SkipJack’s is a must-visit location on the Dutch side of the island! 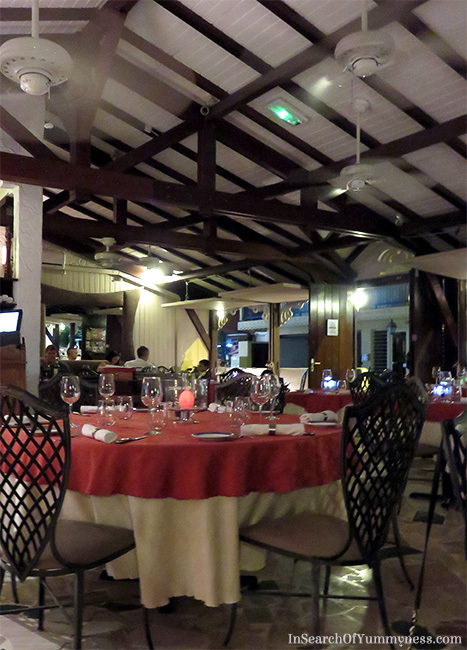 If you’re looking for a fine dining experience in St. Martin, you should definitely check out La Villa. This lovely french restaurants was awarded the 2013 Travellers’ Choice Award on TripAdvisor, and it’s easy to understand why. Unlike some of the other high-end restaurants, the atmosphere here is very relaxed. The food is exactly what you would expect from a fine dining restaurant: creative, beautiful and delectable! This dish shown below is the citrus crusted sea scallops, with caramelized grapefruit sauce and local yuca puree. The thought of not being able to eat this dish again any time soon makes me so sad… it was that good. 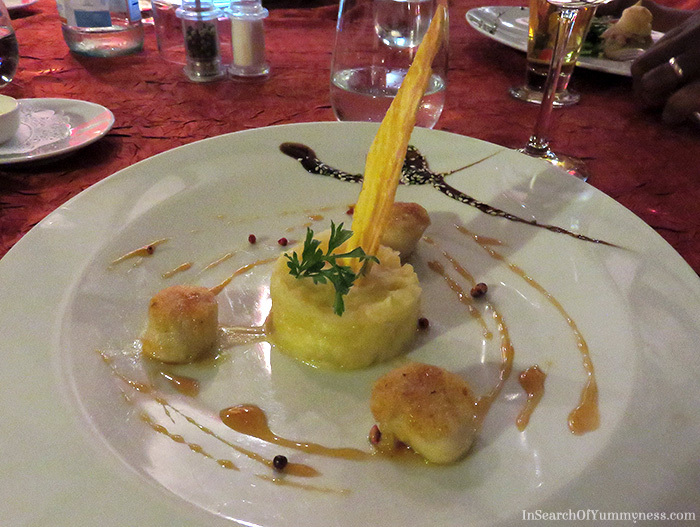 The scallops were cooked perfectly, and had a nice citrus flavour to them. The yuca (cassava) puree was like the best mashed potatoes you’ve ever had, but with an earthier flavour. Oh, and that tall thing sticking out from the top is a banana chip. This was an appetizer dish, which is why the portion is on the small side. La Villa is also known for their amazing desserts. The first image below is a custard assortment. 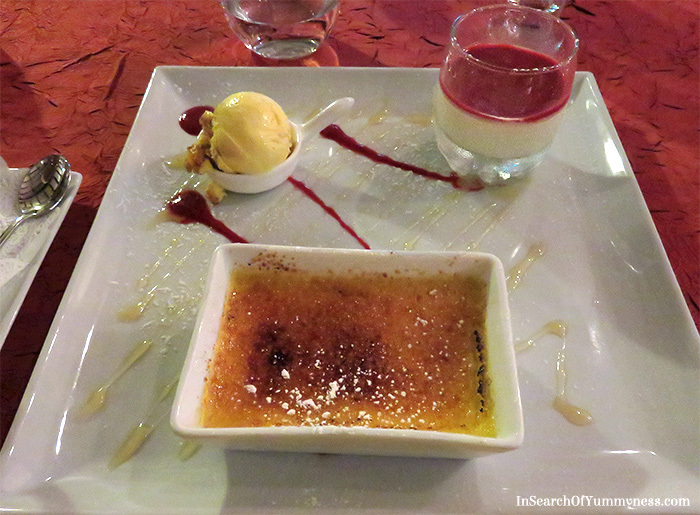 The large rectangle is a vanilla crème brûlée, the glass has an almond flavoured panna cotta with raspberry sauce and the spoon has crème brûlée ice cream. The almond panna cotta was milky and smooth, with a nice tartness from the raspberry sauce. I also really loved the crème brûlée ice cream because it was flavourful, but not overly sweet. 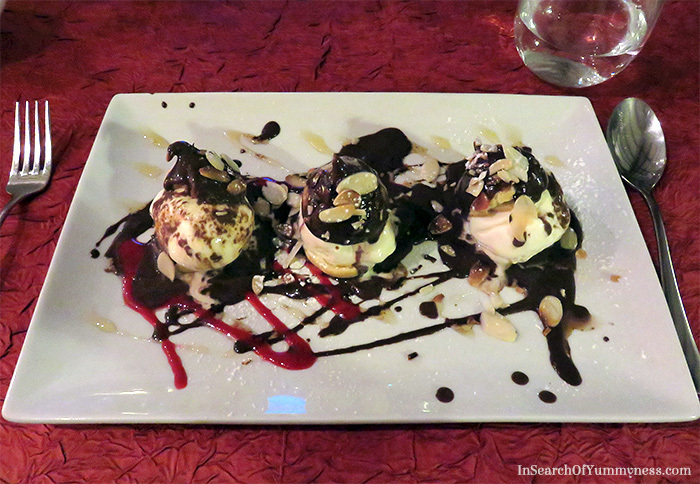 Finally, I have to show you the hot chocolate profiteroles, filled with vanilla ice cream, and topped with grilled almonds. The hot chocolate sauce is spot on – it tastes like cocoa not melted chocolate. This is a sophisticated and playful dessert that’s perfect for sharing. La Villa is located on the French side of the island, in Grand Case. 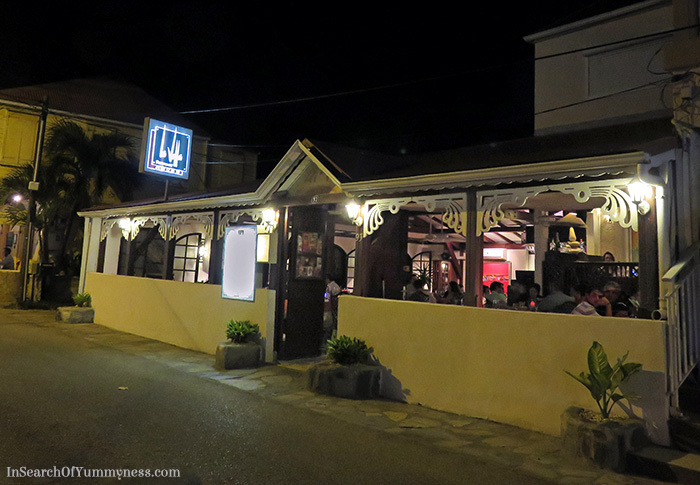 Both of these restaurants are worth a visit, so I hope you check them out if you’re ever in St. Maarten!